The Galatzo range stands high above the North eastern coast of Mallorca, its summits clearly visible from downtown Palma. The Puig de Galatzo, standing just above a thousand meter, can be easily dubbed as Mallorca’s fish trail mountain or Mattehorn, all things being put to scale, because of its sharp and distinctive profile. However, both Esclop and Galatzo are easy to climb, with only a minimal amount of scrambling. The summits are quite barren and rocky, giving out an aura of austere but grandiose wilderness. The main trails are mostly well defined and well marked; they are extremely popular with visitors and Mallorquins on weekends. 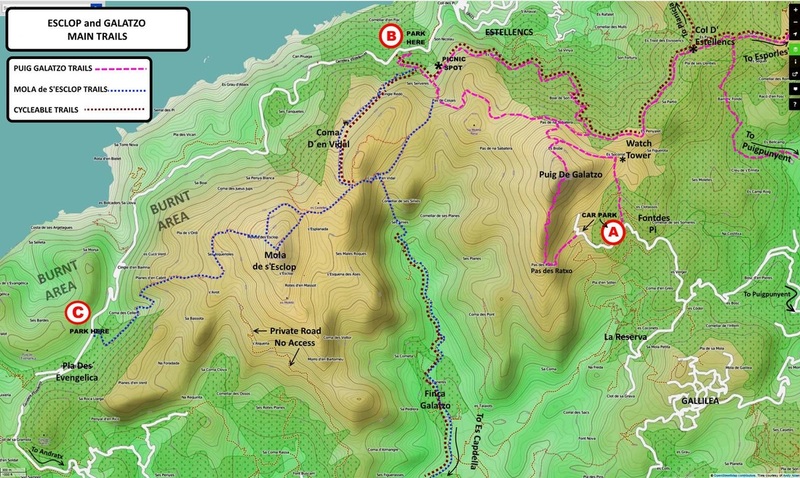 The range can be accessed from various points: the shortest route to the summit of Galatzo starts at the Font de Pi, a few kilometres out of Puigpunyent, close to an outdoor activity park called La Reserva. This is only a 30 minute drive from Palma, but there is no access by public transport. The summits of Esclop and Galatzo can both also be access from Es Capdella in the south and Estellencs on the north coast; the walk from Es Capdella to the summits is substantially longer. Es Capdella is about a 30 min drive from Palma and is on the bus route (service 111) while Estellencs takes a full hour to drive to and is served by bus route 200 (note that some of the scheduled runs are on request and have to be booked 24 hrs ahead) Those hiking along the GR221 from St Elm will reach the summit of Esclop from the Col de sa Grannola following a well cairned route through an area devastated by the big fire of 2012; hikers coming from the west could also enter the massif close to the Coll d’Estellencs. See specific sections for more detailed route access.